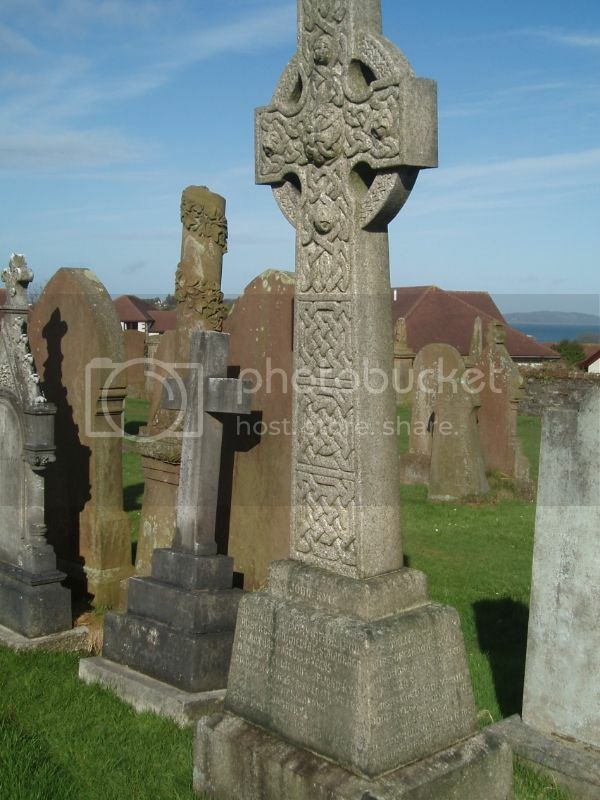 Sheuchan Cemetery and extension, Leswalt High Road, Stranraer (grid ref. NX 055609). Number of identified CWGC casualties: 5. 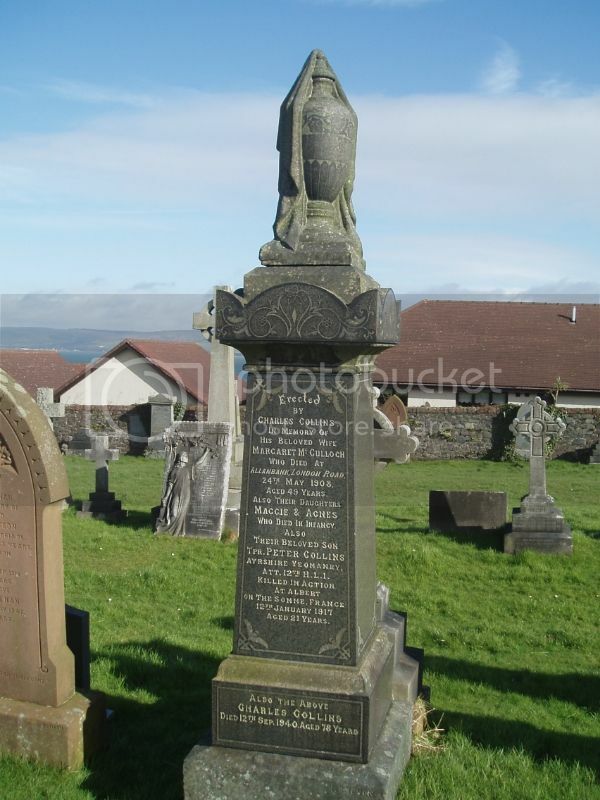 Additional information: Son of Mr. J. Adair, of 13, Agnew Crescent, Stranraer, Wigtownshire. Wigtownshire Free Press (31st October 1918) reported: At City Hospital, Edinburgh, on 27th inst, William Miller Adair, AB, HM, TBD, aged 22, beloved and only son of Mr & Mrs Adair, 13 Agnew Crescent, Stranraer. 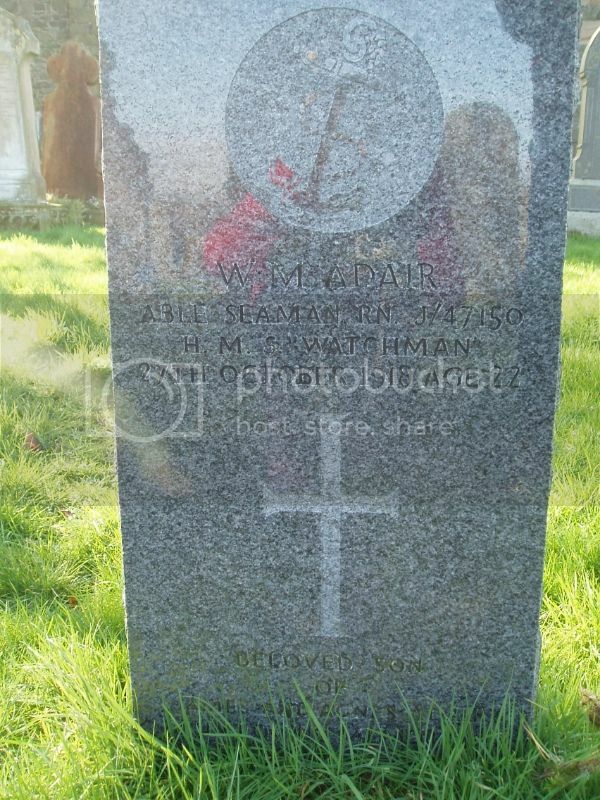 A survey a few years ago by the Dumfries & Galloway Family History Society identified two headstones for William Adair. One was sited right up against the wall of the church but, on our visit today there was only some rubble. 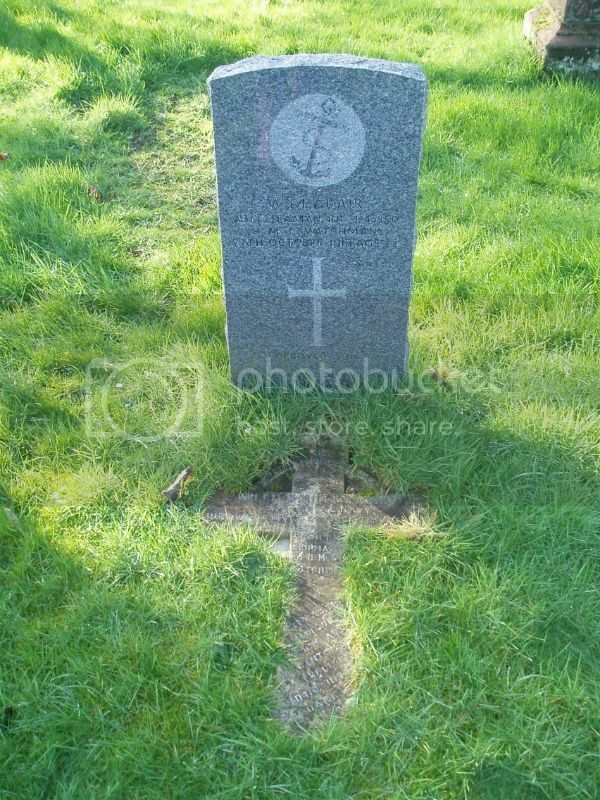 However, lying on the ground in front of the official CWGC headstone was another stone in the shape of an anchor; this is likely to be the one that was next to the church. 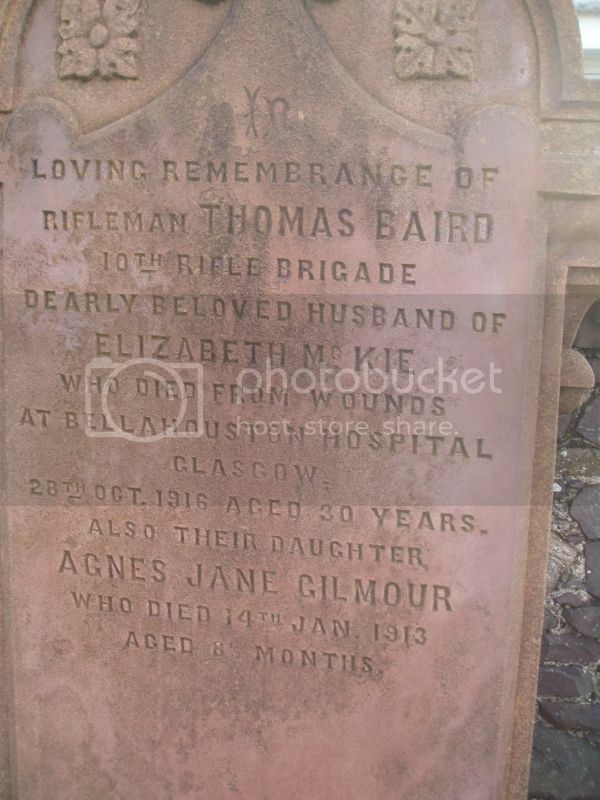 Additional information: Son of James and Jane Gilmour Baird; husband of Elizabeth Wilson McKie Baird. Born at Stranraer. Wigtownshire Free Press (9 November 1916) carried a photograph of Rifleman Baird and reported: It is with much regret that we have to announce the death, at Bellahouston Hospital, on 28th ult, from wounds received in action, of Rifleman T Baird, P.O. Rifles. For many years Rifleman Baird was employed at Stranraer Post Office and for some time he had been one of the burgh postmen. Of a quiet, unobtrusive nature, always courteous and obliging, he was held in the highest esteem by all who knew him. Rifleman Baird joined the Army in June, and had only been a few weeks at the front when he was wounded. He leaves a widow and two young children, for whom much sympathy is felt. 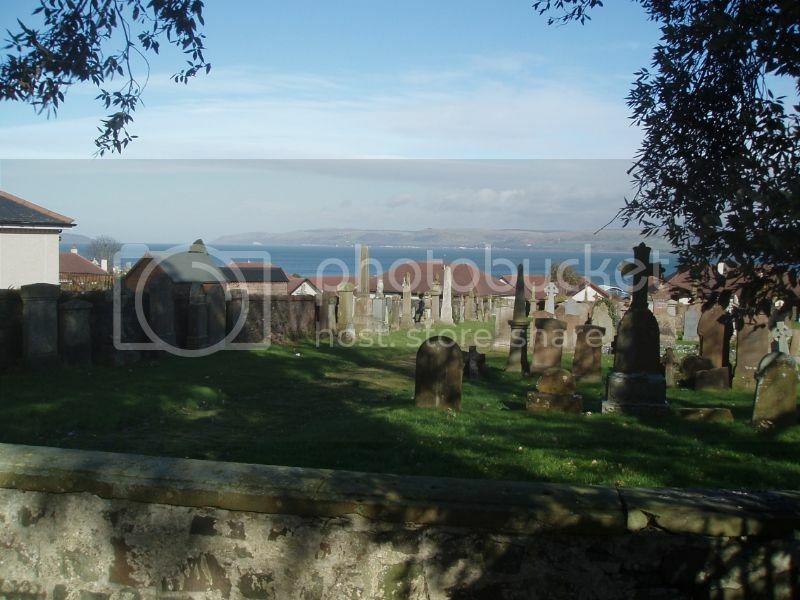 The funeral at Stranraer Cemetery on Wednesday last was largely attended. Additional information: Son of John and Margaret Davidson. Born at Stranraer. 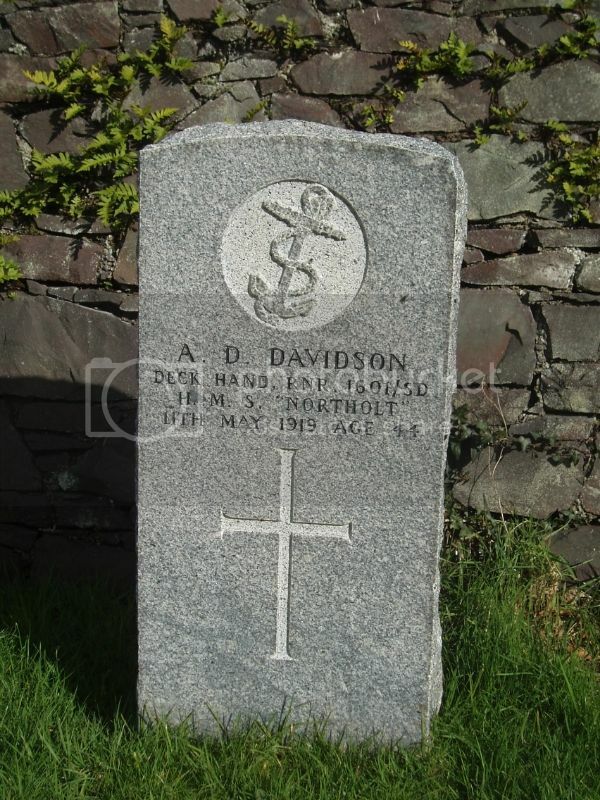 Wigtownshire Free Press (22 May 1919) reported: Mrs Davidson, Fisher Street, Stranraer, has been officially notified that her son AB Adair Davidson, serving on board one of HM minesweepers has been lost at sea. Previous to the outbreak of war he was engaged in the merchant service, but joined the Navy immediately hostilities began, and served on various ships, being engaged in minesweeping when the armistice was signed. When an appeal went forth from the Admiralty for volunteers for the hazardous work of clearing the seas of mines, AB Davidson volunteered and was engaged in this work up to the time of his death. 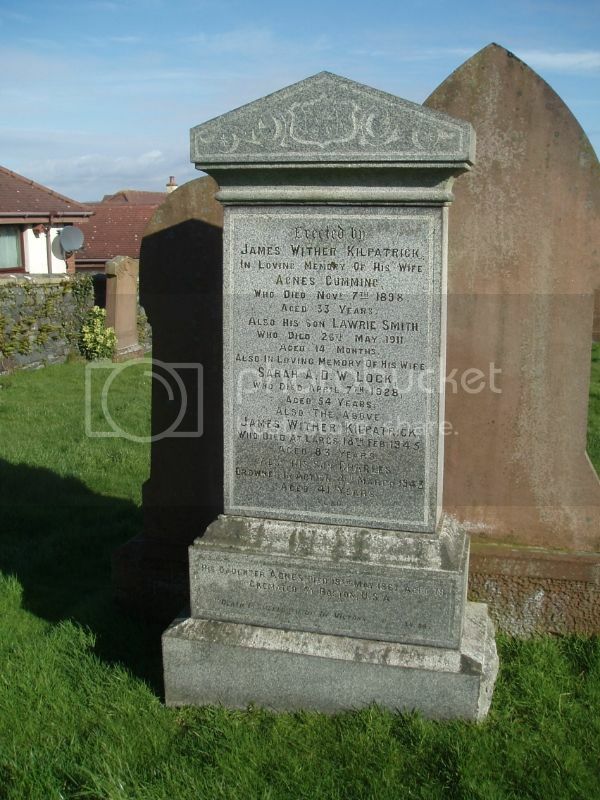 Wigtownshire Free Press (29 May 1919) reported: Drowned at Dover on 11th May, Adair Douglas Davidson, fourth son of Mrs Davidson, 36 Fisher Street, Stranraer, aged 50. 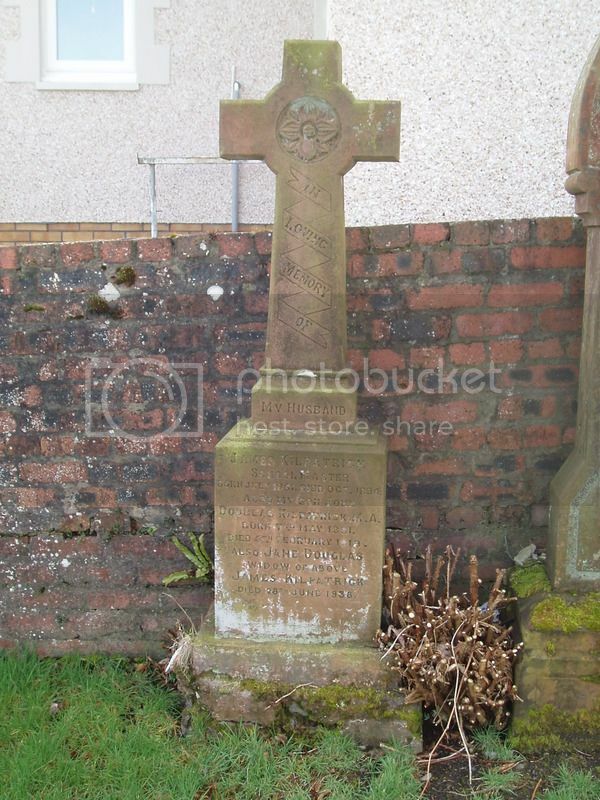 Also named on Stranraer Burgh War Memorial. 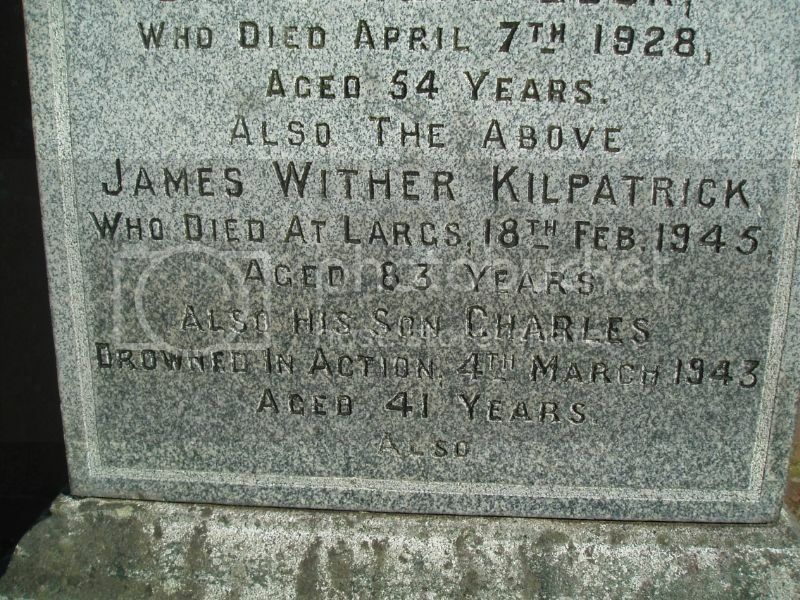 Additional information: Son of Jane Kilpatrick (nee Douglas), of Valparaiso Villa, Stranraer, and the late James Kilpatrick. Teacher in Arbroath High School. M.A. 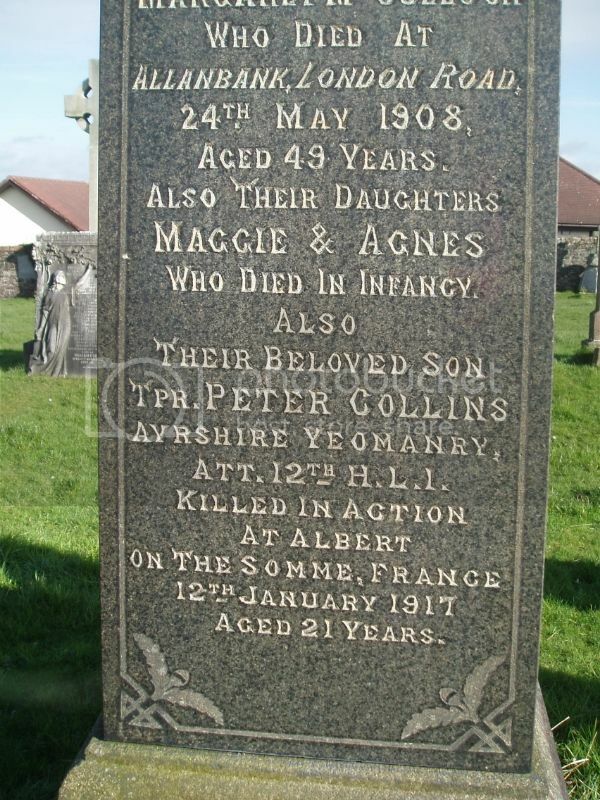 Additional information: Son of the late Margaret Pirrie. Note difference of dates between CWGC record and headstone. 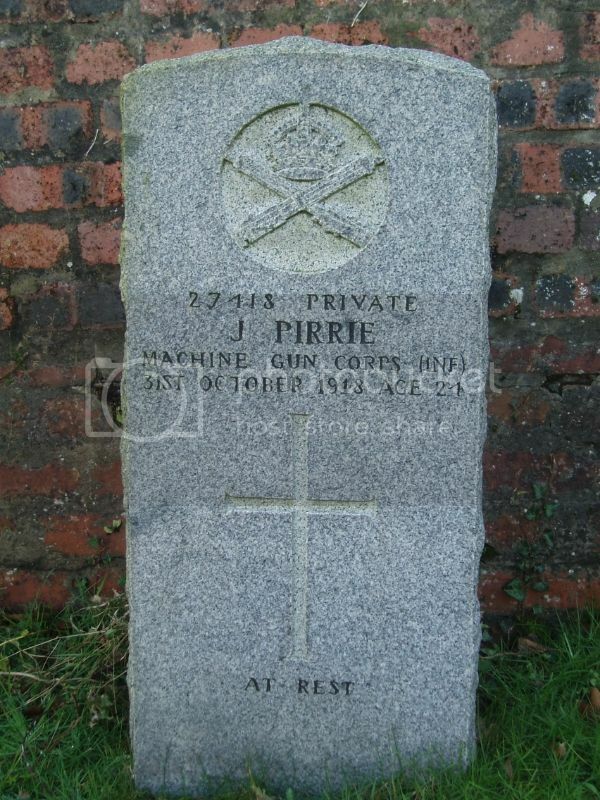 Wigtownshire Free Press (7 November 1918) reported: Pirrie - Died of pneumonia at 5 Back Rampart, Stranraer, Driver John Pirrie, Machine Gun Corps, aged 24 years. Additional information: Husband of Jane Wotherspoon Caldwell (formerly Baxter, nee Forrester), of 165, Delamore St., Kirkdale, Lancs. Born at Govan, Glasgow. The Adela was a cargo ship on the Dublin/Liverpool service. On the 27th of Dec 1917 the defensively armed Adela was 12 NW of Skerries when without warning she was torpedoed and sunk by U-boat 100. 24 lives were lost. Wigtownshire Free Press, 31 January 1918 reported: Lost at sea on 27 December through enemy action, William H Caldwell, second engineer, grandson of the late Hugh Caldwell, 11 Hanover Street, Stranraer. SS Teelin Head was a British steamer built in 1883. On January 21 1918 the ship, en route from Belfast with a cargo of potatoes, was sunk by German submarine UC-31 12 miles SSW of the Owers lightvessel. 13 lives were lost. 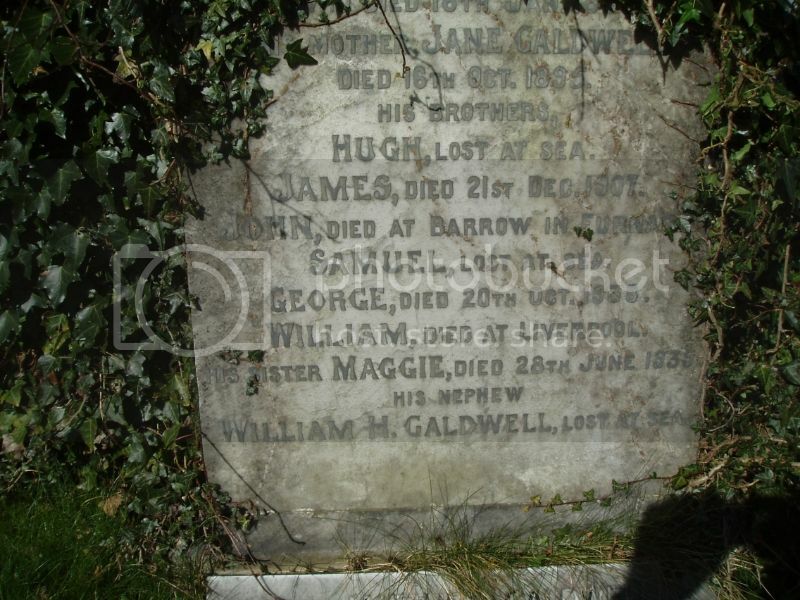 Wigtownshire Free Press, 31 January 1918 reported: Died at Portsmouth on 22nd inst after being rescued from torpedoed ship, Samuel Caldwell, second officer, youngest son of the late Hugh Caldwell, 11 Hanover Street, Stranraer. 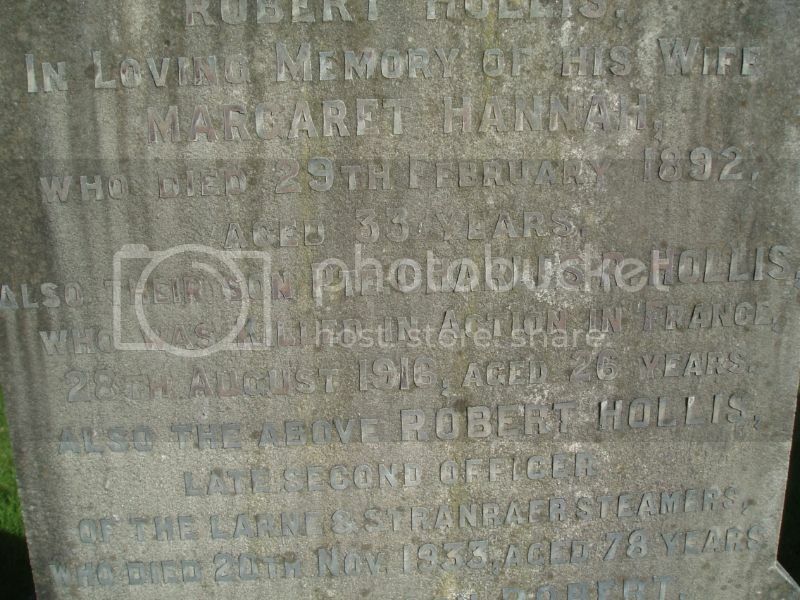 Additional Information: Son of Charles Collins, of "Allanbank". London Rd., Stranraer, Wigtownshire. 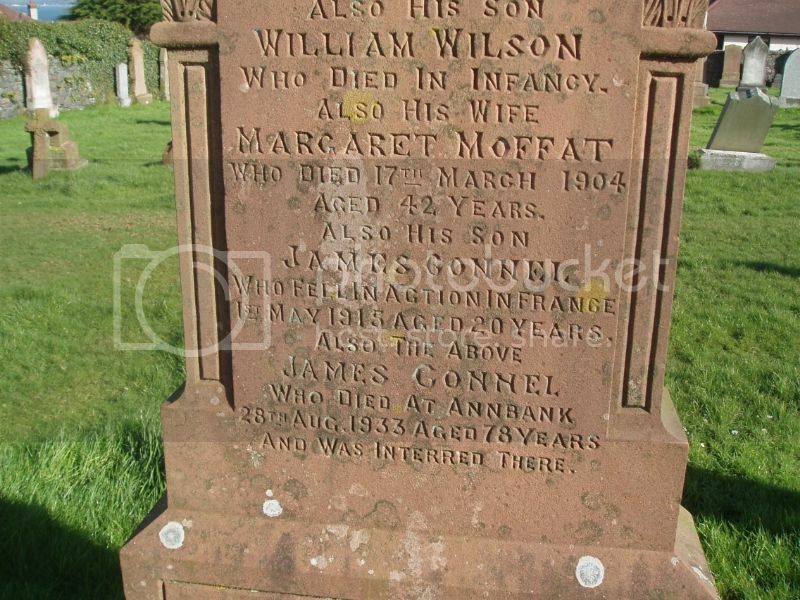 Additional Information: Son of James Connel, of 19, Low Caylton, Ayr. Wigtownshire Free Press, 3 June 1915, carried a photograph of Pte Connel and reported: Mr James Connel, 19 New Row, Coylton, who for many years represented the Singer Sewing Machine Company in Stranraer and district, has received intimation from the War Office that his son, Private James Connel was killed in action on 1st May. In a letter from a comrade, it appears that the regiment went into the trenches on 30th April, but on the following day the position became untenable owing to enemy guns having found the range, and orders were given to retire. This order was being carried out, and Private Connel was making to secure his rifle and equipment when a shell burst wounding him and three others so severely that they died shortly afterwards. 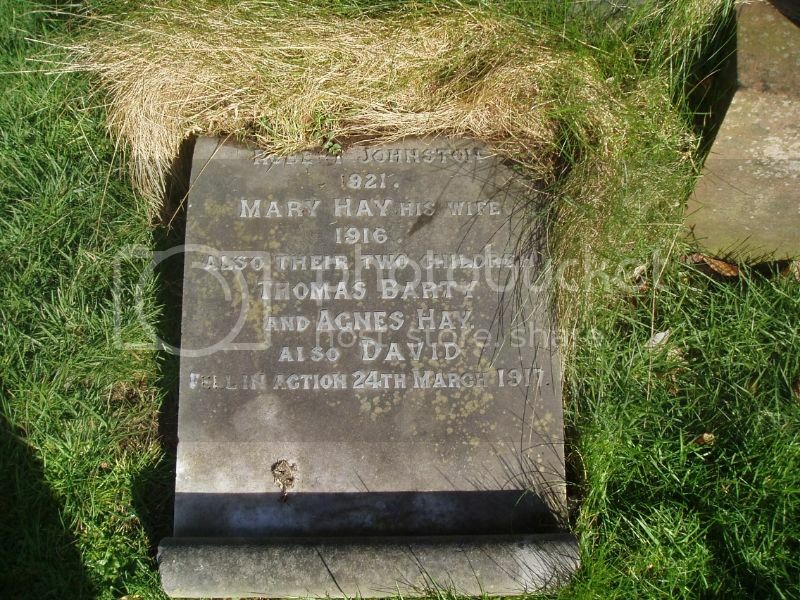 Deceased enlisted shortly after the outbreak of war, and after undergoing training at Cromarty and Fort George, he crossed over to France in March. 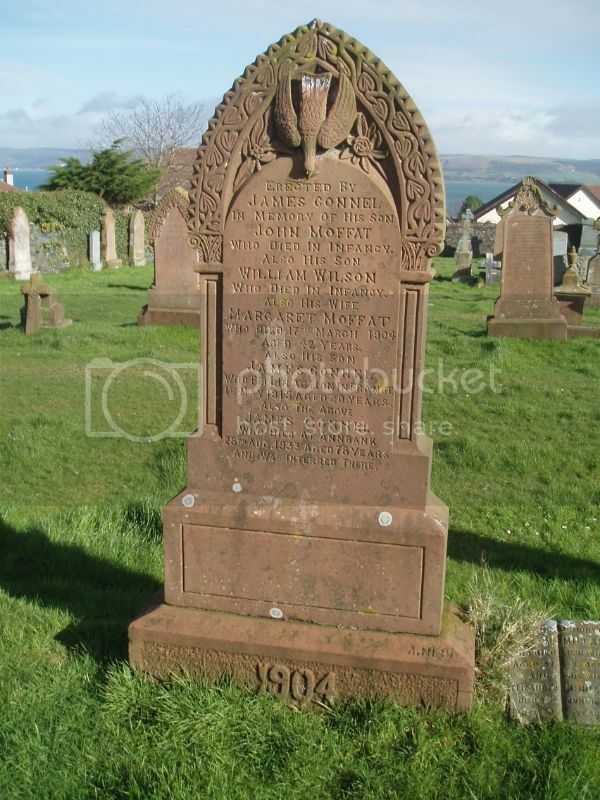 Private Connel was well known in Stranraer, where his boyhood was spent. He was educated at Lewis Street School, and his death at the early age of twenty will be much regretted by his old school companions. Prior to enlisting, Private Connel was employed at Kilmarnock Corporation Tramways. 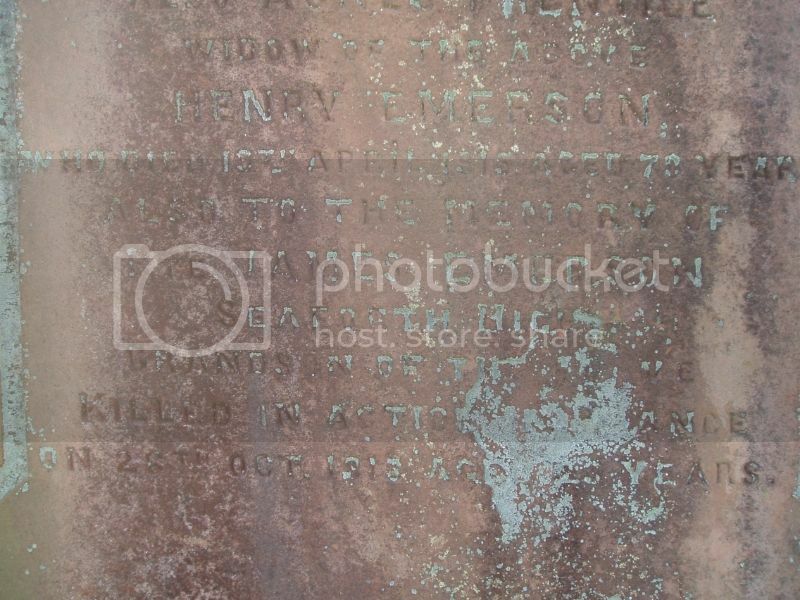 Additional information: Son of Mrs. Emerson, of 131, Station Place, Stranraer. 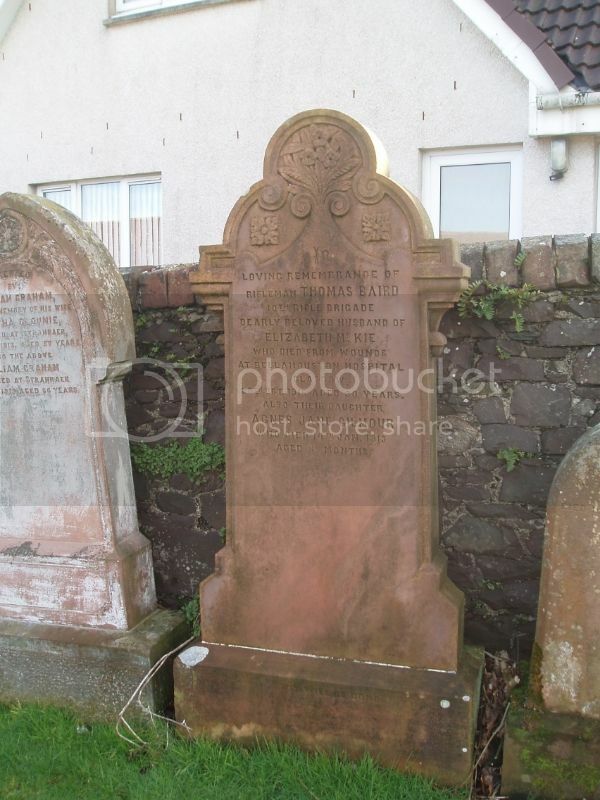 Additional Information: Son of James and Hannah Hall, of 33, Dalrymple St., Stranraer. 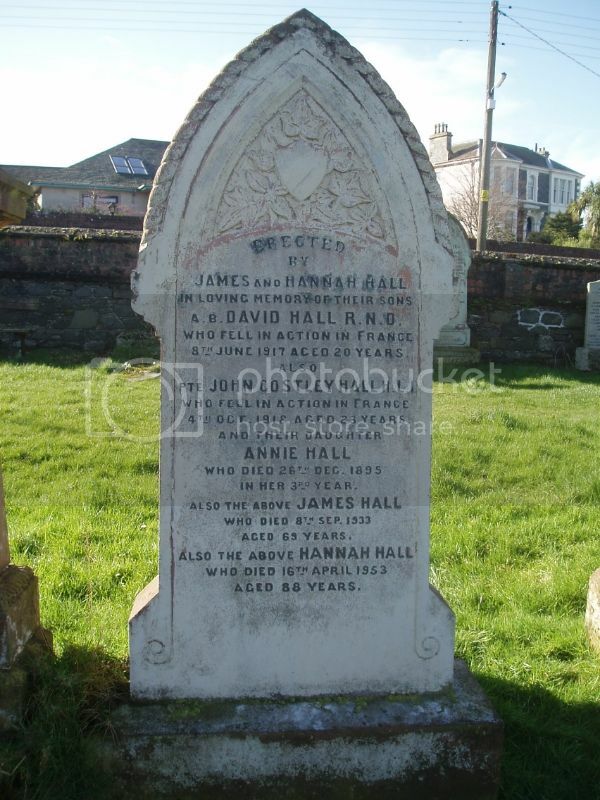 Additional Information: Son of Mr. and Mrs. James Hall, of 33, Dalrymple St., Stranraer, Wigtownshire. 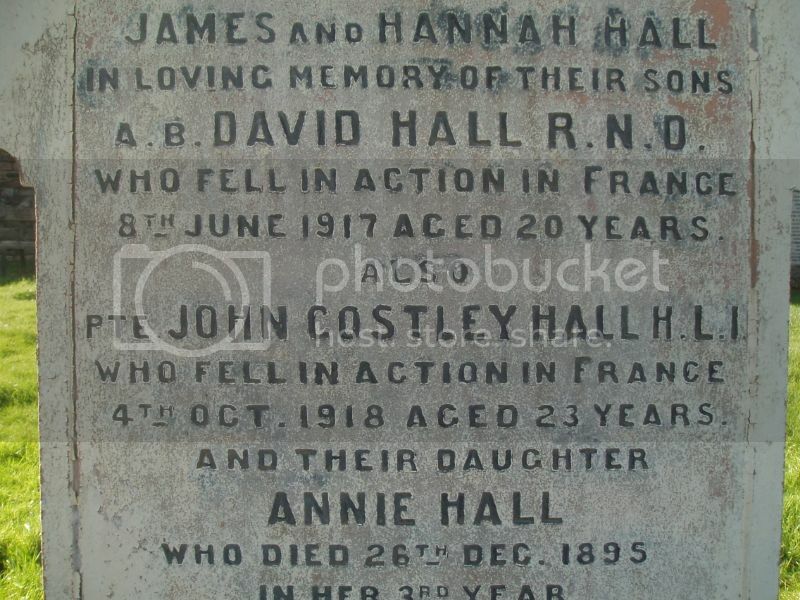 Wigtownshire Free Press (31 October 1918) reported: Killed in action in France on 4th October, Private John C Hall, Trench Mortar Battery, beloved son of Mr and Mrs Hall, 3 Dalrymple Street, Stranraer. 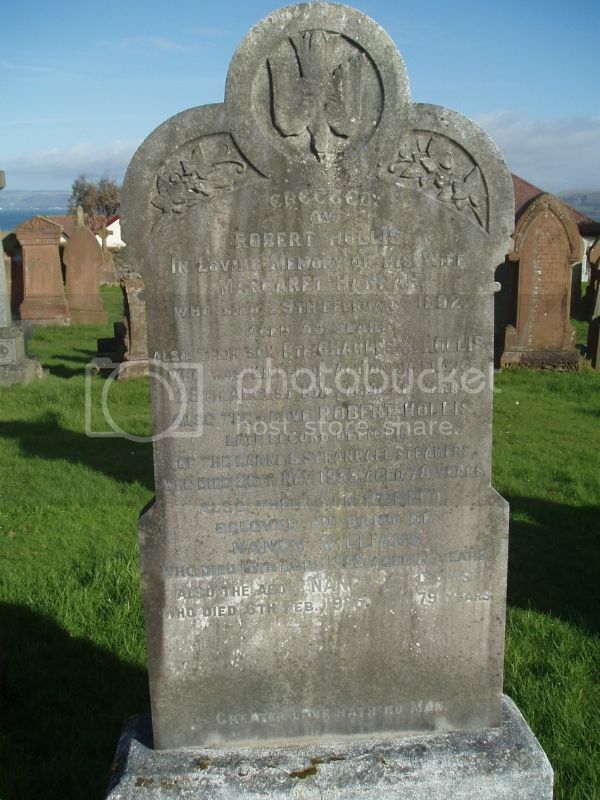 Additional information: Son of Robert Hollis, of 52, Sun St., Stranraer. Wigtownshire Free Press, 26 April 1917 reported: Official notice of the death at Salonica of Driver D.V. 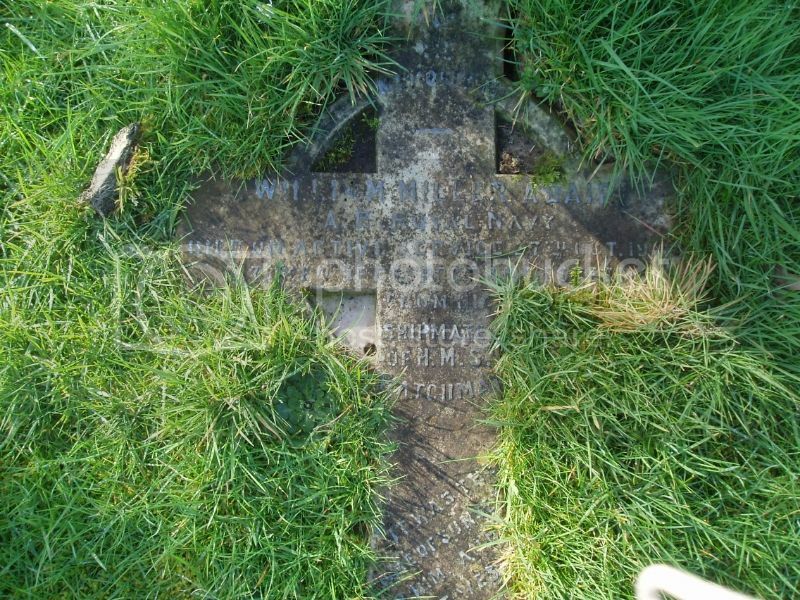 Johnstone, Army Service Corps, son of Robert Johnstone, contractor, Thistle Street, has been received. At the time of joining the army Driver Johnstone was superintendent of Stranraer Slaughterhouse. Prior to this he was employed for several years as a butcher in Helensburgh. He leaves a widow and a little girl to mourn his loss. NB: CWGC spells the surname Johnstone i.e. with an "e", the headstone spells Johnston. 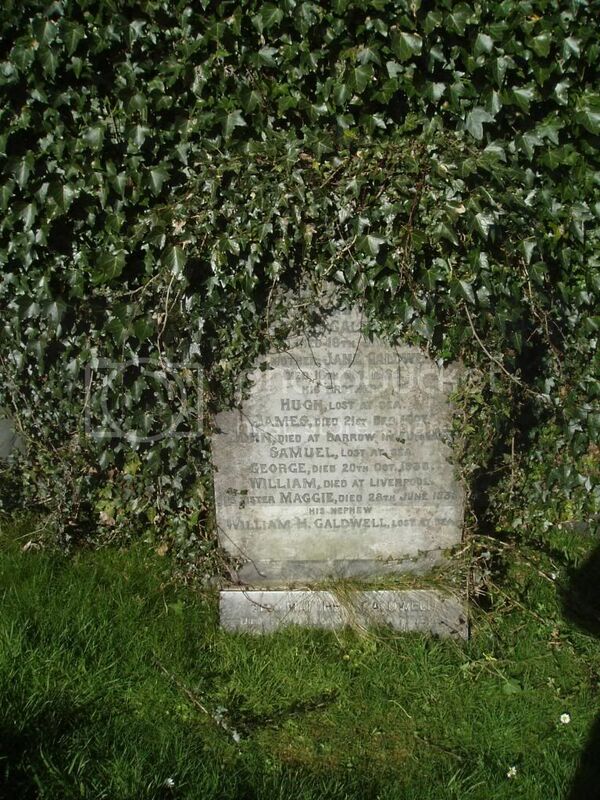 Additional Information: Son of James and Sarah Kilpatrick; husband of Emily D. L. Patrick, of Stranraer, Wigtownshire. 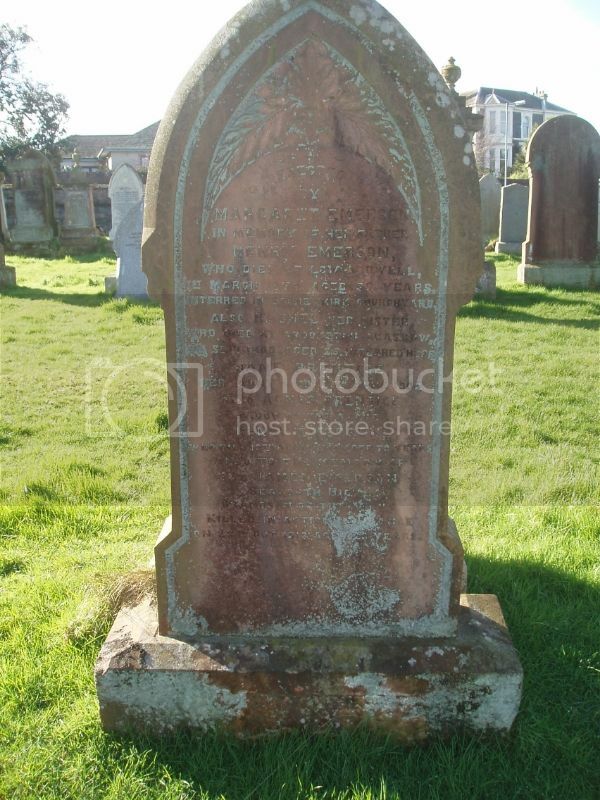 Additional information: Son of Thomas and Elizabeth Stott Kyle, of Seaforth, Stranraer, Wigtownshire. Enlisted Sept., 1914. Twice wounded. L/Gaz Date: 29 December 1916 Issue number: 29886 Page number: 36 - Award of MC. Lt. John Kyle, E. York. R., comdg. T.M. By. Spec. Res., to be Lt. 14th July 1917. Lt. John Kyle, M.C., R.F.A., Spec. Res. For conspicuous gallantry and devotion to duty as forward observation officer. Though wounded early in the day he observed from the front line during a heavy bombardment, which continued throughout the day until the enemy attacked towards evening. The telephone wire was continually cut, and he several times went out and repaired it under heavy fire. Finding it impossible to maintain the line, he went backwards and forwards to the nearest point of the buried cable, and thereby maintained a valuable supply of information. On each occasion he crossed some 500 yards of open ground under heavy fire. When the observation post was damaged by a shell he continued to observe from a shell hole during the day and the following night. It was due to his splendid courage and resource that group headquarters were kept supplied with valuable information. Wigtownshire Free Press (11 January 1917) reported: We are pleased to note that Lieut John S Kyle, 3rd East Yorks, commanding Trench Mortar Battery, has been awarded the Military Cross for conspicuous service in the field. Lieut Kyle, who was a member of the Officers' Training Corps in Glasgow, enlisted as a private in the Commercial Battalion of the HLI on the outbreak of war, but was shortly afterwards gazetted as Second Lieutenant to the East Yorks Regiment. 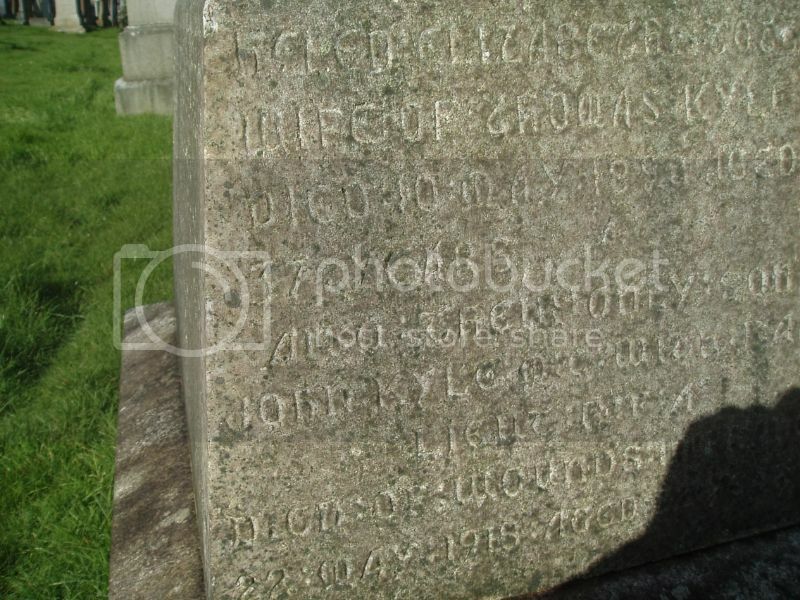 Lieut Kyle is the only son of Mr Thomas Kyle, of Messrs Craig and Kyle, drapers, Stranraer. and 20 May 1918: Mr T Kyle (of Messrs Craig and Kyle, drapers, Stranraer) has received official intimation that his son, Lieut J. S. Kyle, RFA, MC, DSO, died at the 3rd Canadian Stationary Hospital, on 22nd May, of wounds received in action. Lieut Kyle, who was a member of the Officers' Training Corps in Glasgow, enlisted as a private in the Commercial Battalion of the HLI at the outbreak of war, but was shortly afterwards gazetted to the East Yorks Regiment. Subsequently he was promoted to a full lieutenant, and transferred to the RFA Spec. Res. In January 1917, he was awarded the Military Cross, for conspicuous service in teh field, and a fortnight ago it was officially announced that he had been awarded the Distinguished Service Order, in recognition of his gallantry and devotion to duty as a forward observation officer. Prior to joining the Army he was engaged in business in Glasgow.